As an injury and accident law firm that has a long history of service to southwest Georgia and eastern Alabama, we have a deep understanding of the unique problems that military families face in the aftermath of injuries and accidents. The Law Offices of Gary Bruce is proud to offer our legal services to military members and their families at Fort Benning. 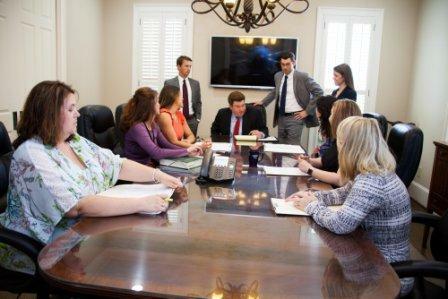 Our law firm focuses exclusively on accidents, injuries and insurance claims. We can also provide referrals to other local attorneys if our military clients have questions involving other aspects of military life or military law. Initial consultations at our law firm are always in a no-pressure environment and are always free of charge, and we handle most cases on a contingency fee basis. This means that we do not receive attorney fees if we are unsuccessful with your case. If you are a servicemember or the family of a servicemember and you have questions about your legal rights in an accident or injury case, call 706-596-1446 to talk to one of our experienced Fort Benning accidents attorneys. Our founding attorney, Gary O. Bruce, has worked as a lawyer in Columbus for more than 20 years and has established a reputation as a trustworthy, honest and practical attorney who understands the special needs and concerns facing military members and their families. We know that families often have trouble making community connections at a new duty station, and we take professional pride in the reliance that many servicemembers place on our law firm to help them handle their legal affairs. Coordination of health care benefits is a major issue after a military member gets in a car accident. Servicemembers who suffer injury in car accidents receive communication from the Judge Advocate General's office or other federal office about repayment of the value of the health care they receive as a result of the accident. These letters are often confusing, but we can usually resolve the problem with minimal hassle for your family if you contact us as soon as possible after receiving any such communication. Car insurance companies often want to reach a quick settlement and may not inform military members about their duty under the Federal Medical Care Recovery Act to reimburse the federal government for health care benefits they receive as a result of car accidents. It is important to consider the cost of these benefits before accepting a settlement. We work frequently with the JAG office at Fort Benning, requesting copies of records and bills in order to explain the full story to the JAG office and the private car insurance company. When it becomes necessary to take an adversarial stance against the JAG office to protect our clients' rights, we have the resources and past experience to use those tactics effectively as well. We also represent people who are injured while on a military base. The process of filing a claim for compensation from the federal government after an injury must proceed under the Federal Tort Claims Act — and it is a very different process from normal insurance claims. The process begins with the filing of a Form 95 within a specified period of time. We have extensive experience handling injury claims under the Federal Tort Claims Act and would be happy to sit down and discuss your rights and legal options. Contact us today to schedule a free initial consultation. The Law Offices of Gary Bruce is located across from the Government Center in downtown Columbus. Weekend and evening appointments can be scheduled upon request, and we are able to schedule meetings outside of our offices for the convenience of our clients whenever necessary.